ZEV CREATED THE MARKET FOR GLOCK TRIGGER UPGRADES. OUR TRIGGERS HAVE WON MORE WORLD CHAMPIONSHIPS AND ARE IN THE HANDS OF MORE PROFESSIONALS THAN ALL OTHER AFTER-MARKET TRIGGERS COMBINED. AT THE CORE OF THE NEW PRO FLAT FACE TRIGGER IS THE ZEV PROPRIETARY TRIGGER BAR AND PROFESSIONAL CONNECTOR, DELIVERING THE CRISPEST, CLEANEST TRIGGER-PULL AVAILABLE. 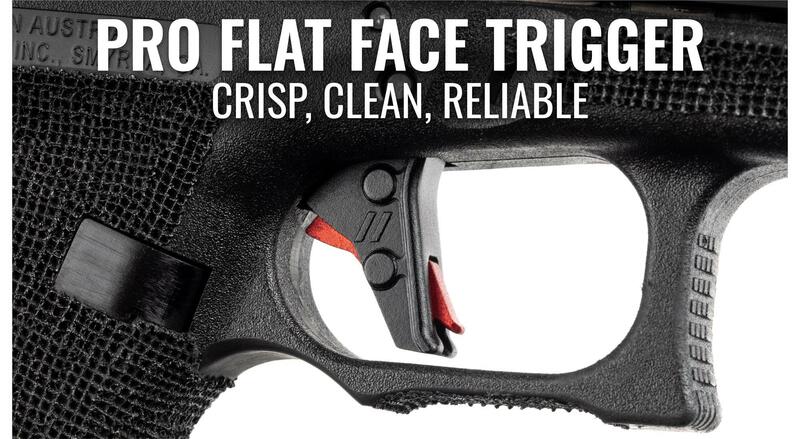 Our new Flat Face trigger pad features a revolutionary riveted assembly process that makes it the longest lasting and most reliable replacement trigger on the market. Available as a Trigger Bar only upgrade, Drop-In Kit upgrade, or as an Ultimate Kit upgrade. Gen 1-5 models.